There are a lot of different ways to experience Tahoe, but one of the classiest has to be while tasting wine and cruising the lake aboard a classic wooden boat. 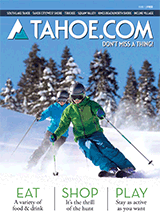 Tahoe Tastings provides midday and sunset tours from Keys Marina to the iconic Emerald Bay. En route you'll get to sample a number of wines and enjoy the scenery for two hours. To really make it a once-in-a-lifetime cruise, book a private excursion for up to 16 people. The private cruise is the way to go if you want to include youngsters, because the daily trips are for passengers of legal drinking age.